Ana Middleton, president and chief merchandising officer (CMO) of the Army & Air Force Exchange Service (AAFES), is no stranger to the rigors of the highly competitive retail environment. With major focuses on popular national brands and the Exchange’s own Be Fit line, Middleton looks to fiscal 2019 as a pivotal year, with the military resale community joining together in a new buying alliance. In this exclusive interview, Middleton discusses the new year, going over strategies and techniques that will help make the year a memorable one for the Exchange. E and C News: As you open fiscal 2019, what are some of the challenges that you face as you strive to generate solid sales during the new fiscal year? Ana Middleton: A highly competitive retail environment, full of innovation, technology and diversification, requires a sustained focus on efficiencies and prioritization of programs truly capable of growing sales, earnings and dividends critical to military recruiting, retention, readiness and resiliency. One of our greatest challenges remains driving traffic back to the installation on weekends and evenings, and we are aggressively working collaborative marketing efforts with the Defense Commissary Agency (DeCA), our sister exchanges, the Army Installation Management Command (IMCOM) and services to entice Soldiers, Airmen and military families back to the military installation. We are committed to demonstrating the relevancy and value of the hard-earned military exchange benefit — it has been a part of military life for nearly 124 years (and my life for 56 years) — and remains a force multiplier to our nation’s fighting force. Roughly 60 percent of AAFES earnings support quality-of-life programs on military installations worldwide, including Army Child Development Centers and fitness centers, Air Force Outdoor Recreation programs and more. I personally benefitted from these great programs as a military brat, and fully appreciate the value these hold for military families. The Exchange and the vendors who support the organization’s mission also give back to the military communities we serve through extraordinary customer experiences. Military-exclusive pricing, for categories such as cosmetics, home goods and clothing, is key to bringing authorized shoppers into our stores. In-store events and appearances by celebrities, recording artists and professional athletes also differentiate the Exchange benefit from the competition while enabling us to create a sense of community and belonging for our nation’s heroes and their families. 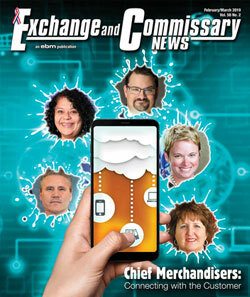 Coming off a challenging retail environment in fiscal 2018, Rich Honiball, the Navy Exchange Service Command’s (NEXCOM) executive vice president (EVP) and global chief merchandising and marketing officer (GCMMO), looks at the current retail landscape and acknowledges that NEXCOM is no different from any other retailer, with customers buying less; and when they do buy, they are making more educated purchases. But NEXCOM differs from other retailers in that it is engaged with a discerning eye to NEX shoppers’ wants and needs, as Navy Exchanges are more connected to their customers and their needs than ever before. In this exclusive interview, Honiball goes over NEXCOM’s current retail objectives, looking at both the challenges and opportunities that await the exchange service command during the new fiscal year. Rich Honiball: We face the same challenges that all retailers face: customers are buying less stuff. They are seeking greater value, looking more at experiences and expect to be able to shop when, where and how they want 24/7. After the conversations about channels, it really isn’t about one channel (stores, web, mobile) over another, it’s about a total experience. Customers may want to get a text alerting them to a sale, look at the item on mobile, do research online, then go into the store and buy it. Tailoring our assortments, personalizing our messaging and allowing customers to craft their own “journey” through the NEX is challenging, but it is an exciting challenge, and one we have been building tools, strategies and resources for over the last several years as we have seen the shifts. I think the other challenge is really communicating the value of our products and services and the overall value of the benefit that we offer. I am confident that we really offer a better value than the outside-the-gate retailers in most of our products, but we are looking at new ways to better communicate that. We are proud of programs like our “Low Price Guarantee,” which ensures that the top several hundred items that customers buy week in and week out are cheaper than the competition, even before factoring in no sales tax. Now, as we face these challenges, which can be daunting especially in the environment that we are in, I think we have reason to be encouraged. I recently attended a meeting at the National Retail Foundation (NRF) with fellow CMOs, and many brands were lamenting their struggles in attracting younger customers to their brands. We have this customer already coming in, and we are seeing strong growth in our Student and Fleet stores, where we have tailored our assortments with more value-oriented apparel, the latest electronics and more healthy food and beverage options. We are able to better connect and communicate with this audience today than we were a couple of years ago with more personalized emails, mobile/ texts, social media and even with video on several of our bases and online. Since being promoted to her current position about a year ago, Cheryl Lemmon, merchandising branch head of the Business and Support Services Division (BSSD) — the body that oversees the Marine Corps Exchange (MCX) — has furthered an approach to reach sales goals, at least in part, by driving topline sales through innovation and response to customer needs. Keeping an open ear to needs and wants, Lemmon and her team continue to strategize communications and marketing to further push the sales envelope. In this exclusive interview, she tells how that sales strategy will be furthered in 2019. Cheryl Lemmon: As we look at fiscal year 2019 and frankly into 2020, we are faced with a unique set of challenges. While as a government retail entity, we have always had to balance between growth of the business and providing solid value and returns to our Marines and their families, moving forward, we are doubling our efforts in innovation and designing our new customer experience. It is clear: we cannot hope to succeed if we don’t continue to innovate and build out resale offerings that provide real value to our customers. As part of this innovation, we are highly focused on designing a truly unified customer experience. We’ve spent the past year digging into what “ecommerce” means to the Marines, especially those living and working on base — what categories they want to buy online, what they want delivered instead of picking up in store, etc. We believe that the findings from this work will give us great insights to develop a unified experience that will allow us to create a solution that lets us compete where we can win, without building an expensive or unprofitable infrastructure for traditional e-commerce. We continue to see our traditional main store business challenged, and we have to find new businesses or profitable alternatives to align to our customers’ changing desires. A couple of categories that come to mind are designer handbags and furniture. Where we see sales loss in high-margin categories, we have reimagined the business and are even willing to find third-party vendor partners where that business is their core competency and expertise. Our consignment luxury handbag business and indirect furniture operations at MCAS Cherry Point, N.C., MCB Camp Lejeune, N.C., and soon-to-be MCAS Iwakuni, Japan, have improved profitability and productivity of those businesses. Samantha Bishop has been the Coast Guard Exchange (CGX) chief merchandising officer (CMO) for the past two-and-a-half years, and during this time, the exchange system has had to withstand not only a fiercely competitive retail environment, but also weather disturbances and even a government shutdown as it has pressed forward — and it has managed not just to survive, but to thrive, during this very trying period. In this exclusive interview, Bishop talks about new opportunities, and how communication might be one of the keys to furthering these successes. E and C News: As you open fiscal 2019, how will you strive to generate solid sales during the new fiscal year? Samantha Bishop: For this year, our primary focus is on the opening of our new store in Centreville, Va. — situated on the western portion of the D.C. beltway. This is going to be a flagship location, containing over 40,000 square feet of selling space, and will be the largest footprint for a Coast Guard Exchange (CGX) store to date. We’re planning around $9 million in sales for 2019 and are targeting a grand opening date for late July. We are very excited about this new opportunity, but with any expansion there are some growing pains. With our small buying team, expanding our vendor partners and categories to accommodate such a greater footprint has been quite a job. For CGX, this is a unique location, and we will be purchasing new product for Centreville that we have not previously carried in our other stores. Seeking out those resources and developing relationships has been a challenge; but our sister services have been very supportive in helping us to make those initial contacts, and we are relishing the excitement that comes with building something totally new. I also see this as an additional benefit in the opportunity to expand these “new” vendors and categories beyond Centreville into our growing e-commerce platform. Later this spring, we will be rolling out ship-fromstore – so we see these new products as being not only available to our Centreville patrons, but now available to all “Coasties” through our shopCGX.com platform. Our top targeted growth areas are men’s furnishings, designer sunglasses, pet supplies, and higherend electronics products. Some other interesting additions will be a new control label wine program that we are very excited about, and the addition of extended sizes in women’s apparel. This store will have our first Homeland Blend & Brew coffee shop featuring Proudly Brewed by Starbucks Coffee. We see this as a great opportunity to test these and other programs for possible expansion into other CGX store locations. Starting his Veterans Canteen Service (VCS) career in 2007 as a buyer after a long civilian retail career, Chief Merchandising Officer (CMO) Carey Filer has witnessed the canteen service’s transformation into a 21st-century retail organization first hand as he moved up the ladder from that position to his present status. The transformation continues into 2019. In this exclusive interview, Filer talks about many facets of the VCS’s current operation, including driving sales and earnings. Carey Filer: Consistent year-over-year sales growth is the goal for any organization, and while we had a very successful 2018, there are still opportunities to drive additional revenue in the upcoming year. One challenge would be the increased sales penetration of our women’s apparel and footwear businesses. Last year, we grew our total women’s business by an increase of 10.3 percent, and we have set another aggressive sales plan at a sales increase of 9.8 percent for this year.